In this article we will discuss in detail about what is DLNA, How DLNA is related to Kodi and how to enable DLNA on kodi. 3 How to enable DLNA on kodi? 4 HOW TO USE KODI DLNA STREAM? The term DLNA stands for “Digital Living Network Alliance,” and it is a standard industry for sharing network data combined with “Universal Plug and Play Audio Visual(UPnP). This options can be used to share your media libraries from one device to another. If you have a PC or Kodi Box for your Tv, you can share its media contents with other Smart TVs, Game Consoles, Phones, etc. around your house. So, Switch on on UPnP\DLNA service on Kodi to enjoy this setting. At the DLNA/UPnP, Kodi service setup steps begin to make sure that you backup Kodi first because you may have a chance to restore the settings to your Kodi. In this guide, all the process comes under Kodi 17 Krypton, but this process is similar for all versions of Kodi. A Kodi UPnP server/media can stream its content to other devices on the same network by using UPnP and DLNA protocols. 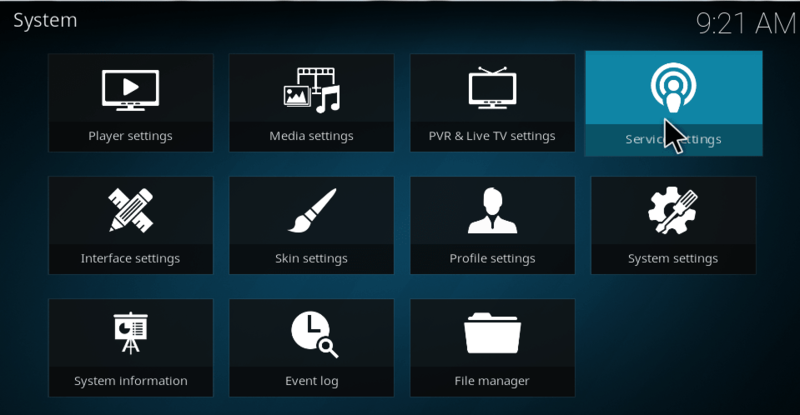 The main aim of this guide is to show the process of Kodi DLNA and its streaming procedures. Read: How to enable zeroconf on kodi? How to enable DLNA on kodi? In this subpart, we are going to demonstrate how to enable DLNA\UPnP server settings by using simple steps it can only take 5 minutes to complete these process. 3. Choose Service Settings from the lists of System options. 4. Go to UPnP/DLNA Settings from the service options. 5. Switch On Share my Libraries from the DLNA Settings. When this is enabled, Announce Library Update will also Switch On automatically. These are the complete procedure to enable DLNA from your Kodi, and now you are ready to stream your receiving device. HOW TO USE KODI DLNA STREAM? Once you enable DLNA Kodi service then only open up the DLNA application on your receiving service and your Kodi system should be visible. It can navigate through the media library folders. Then click on a movie or music file to launch. You have now completed the Kodi media server setup process. Play On is a DLNA media server and browser for your Windows Pc. It allows online media sources such as Netflix and Hulu and also supports local content. It’s available only on Windows it is the sad part of this software. UMS is a DLNA server that focuses on stability and File compatibility. It is an Open source and entirely free software. But it uses only in JAVA. Features: Web Interface and Satellite Integration. Plex is well known for its Cross- platform compatibility and ease of setup. Its free to share media on your local network. Features: Cloud Streaming, Media Syncing. Serviio is a JAVA based DLNA media server, and it allows you to stream your media files on your Home Network. It supports local and Online content. The Emby server is a new rapidly growing media server, and it supports transcoding. But it has some bugs within it. Features: Live Tv support, Media Management, and Cloud Sync. These are the five great kodi DLNA media servers that use for streaming media contents around your Home. So, study the above procedures of Kodi DLNA and make use of it. Enjoy. On a Windows 10 PC there is Universal media server running. On a Android TV box there is kodi running. I add upnp folder as file source.